These will be based on Carats.io's Diamond Financial index (DFX) and its CARAT coin, which is the world's first cryptocurrency fully backed by real diamonds. As part of the MOU, the two parties agreed that IDEX will serve as an escrow company, supporting Carats.io in its acquisition of diamonds to back the digital CARAT coins that it issues, providing diamond-buying and logistics services from sourcing to vaulting. The diamonds will be acquired from international companies operating on its platform in jurisdictions where cryptocurrency-based diamond trading is sanctioned by law, up to U.S.$120 million worth in the initial stage of the agreement. In finalizing the MOU, the heads of the Carats.io and IDEX emphasized that together they are uniquely positioned to energize and engage with the international diamond sector. IDEX brings to the table a B2B diamond-trading platform with more than 1,500 suppliers and 7,000 professional traders from across the globe, an online pool of 750,000 diamonds, and a wealth of financial data gleaned from up-to-the-minute records of actual transactions. The value of Carats.io's cryptocurrency is linked to daily movements in the DFX index, which is generated without human involvement by a sophisticated proprietary algorithm developed by the company, fed by real-time market data. The diamonds held by the Carats.io to back the CARAT coin, as well as the algorithm, are independently audited by the international accounting firm Ernst & Young. "We are pleased to be cooperating with Carats.io, and to be able take advantage, on behalf of the diamond industry, of the synergies created by our two organizations working together," said Ehud D. Cohen, IDEX's Chairman. "IDEX - International Diamond Exchange represents the new economic and technological order, which not only has changed the diamond industry's business environment since the year 2000, but also is the place from which new solutions can be found. And it is innovating and delivering those solutions that we are committed to doing." 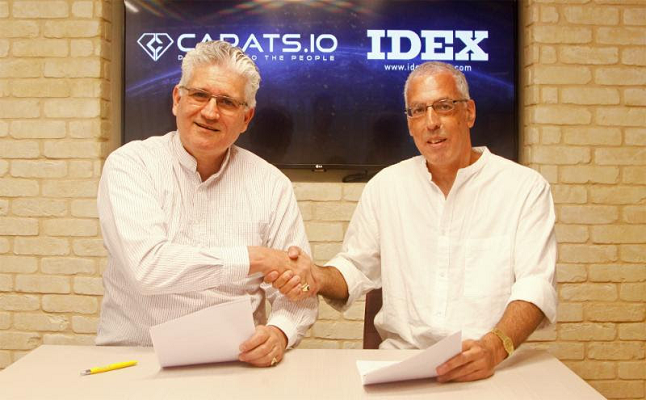 "We are delighted to announce our cooperation with IDEX," said Eli Avidar President of Carats.io. "Its worldwide reach, excellent international position, and its exceptional strength in Antwerp will enhance our business operations, especially since Carats.io is UK registered. Carats.io was built to bridge the traditional economy with the digital economy, and in so doing provide access to funding and investors that have not been part of the diamond and jewelry business." Pictured above: Eli Avidar (left), President of Carats.io, and Ehud D. Cohen, Chairman of IDEX - International Diamond Exchange, following the signing of the MOU between the two companies, signaling the start of their cooperation agreement.